I always love running into my adorable neighbor, Calvin Radsick, when I’m taking my dog out for a quick spin. I was especially elated to see him in some denim on denim today. Calvin is pictured above in a Volcom denim finish hoodie and Sliq jeans From H&M. His dog, Izzi, is rocking an electric pink hoodie from American Apparel that I kind of want to steal. 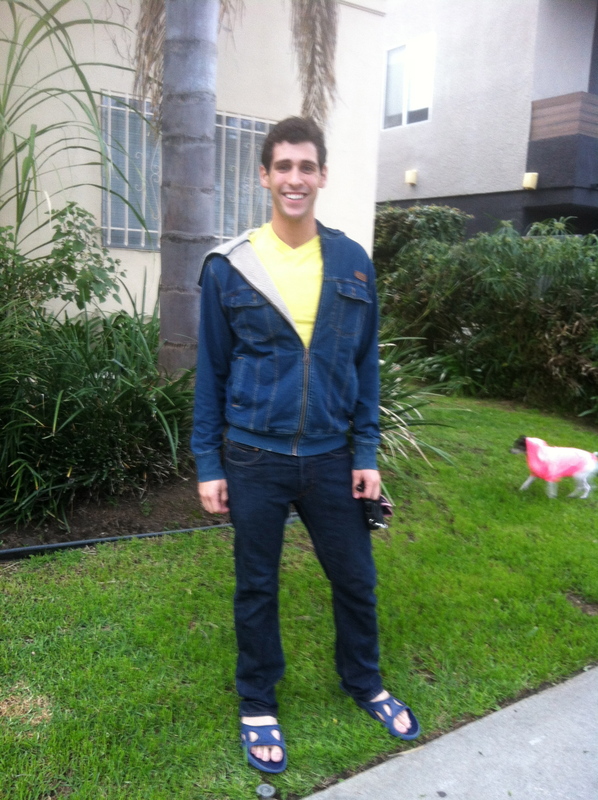 This entry was posted on Thursday, March 7th, 2013 at 6:49 pm	and tagged with American Apparel, Calvin Radsick, Canadian Tuxedo, Denim, Denim on Denim, double denim, H&M, hoodie, Jeans, Sliq, Volcom, West Hollywood and posted in In The Wild. You can follow any responses to this entry through the RSS 2.0 feed.